Many of us in the party are turning our minds to the upcoming Federal election. We have in place a strategy and plan for the election, and we are now implementing that. Many volunteers are involved now, and many more will be required throughout the next few months leading up to the day of the election. The current expectation is that an early election will be called, following on from the passing of the changes to the Senate voting system. If that happens, and we face an election as early as July 2, we need to be organised before May and ready to fight for votes for 8 weeks. If an early (possibly Double Dissolution) election does not happen, we have a little longer, and we will be even better prepared. We have just recently sent out a second call for people to nominate themselves for election to the Parliament on behalf of animals. More realistically, in the Lower House, we seek more to influence who does win the seat, and use this leverage to influence policy and legislation. In the Senate, we certainly can win, especially if there is a Double Dissolution and all 12 Senators are up for election. Members interested should forward a brief candidate statement (no more than one page) to anjali.nambissan@live.com where it will be forwarded to the pre-selection committee(s) in each region. You may also want to contact your Regional Group Leader for your region to discuss the matter. Your candidate statement should include your full name and contact details, reasons for wanting to stand as an AJP candidate and your background with the animal protection movement (roughly 200 words). Applicants will be provided with additional paperwork, including a candidate agreement and statutory declaration. Please forward expressions of interest to anjali.nambissan@live.com on or before Friday the 25th of March. Meanwhile, we need to continue to run the party here in Victoria. The party is led by a Committee of seven people and a Working Group of about 20-30 people, and the eight Regional Group Leaders. We agreed at a workshop and members' meeting about one year ago that the Committee positions would be elected each year, before May if possible. We have recently appointed a Returning Officer (person who runs the election), Justine Curatolo, and she has sent out a call for nominations for the next year of Committee work. As current Convenor, I would say that the existing committee members have done a good job over the last year. I commend them for their work and appreciate that they have been able to work together effectively and well. Thanks to Brenton, Rosie, Andy, Kristin, Vanessa and Eleonora. I am aware that at least one of these committee members will not re-contest, because they want to do more work in other areas for AJP. In any case, we invite anyone who has the desire to contribute more to the organisation and take a leadership role to consider contesting the election by the members. After nominations, you will see candidate statements available on our website, at least one 'meet the candidates' session, and every financial member will have the opportunity to vote. We expect the result of the election to be known by the 5th of May, and the new committee will meet on the 12th of May. If you wish to vote but have not yet renewed your membership, get it done by the 'close of rolls' on the 21st of March. The Summer newsletter of the party was recently issued and is available here. Read a report on our recent Annual General Meeting (AGM) and news and views from all the states. Please join us for an informative and inspiring afternoon with two leading thinkers in the UK vegan movement. 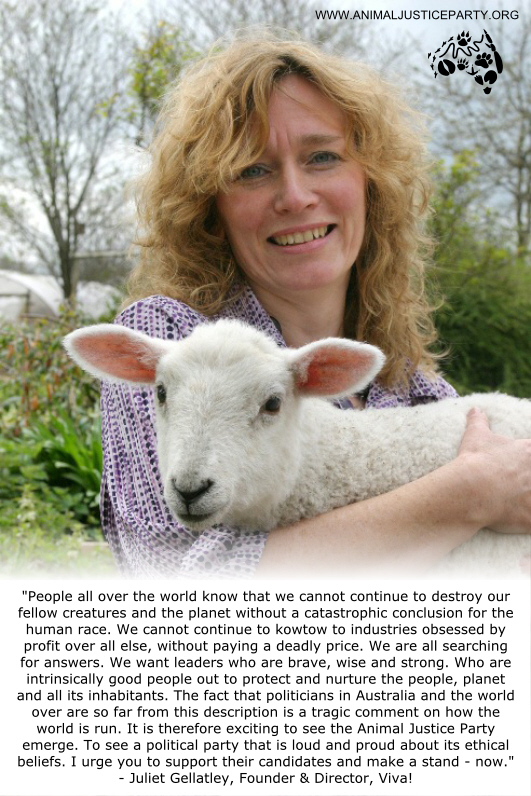 Jasmijn de Boo is the CEO of the Vegan Society UK, the oldest vegan society in the world. She holds an MSc in animal behaviour and welfare, and has advocated humane solutions to harmful animal use in education and research. She is the founder of the Animal Welfare Party in the UK and is a regular contributor to the Huffington Post UK. Australian-British animal ethicist Dr Andrew Knight is a European and American Veterinary Specialist in Animal Welfare; a Professor of Animal Welfare and Ethics at the University of Winchester; and a Senior Fellow of the UK Higher Education Academy. Andrew has over 80 academic publications and YouTube videos on animal issues. These include an extensive series examining the contributions to human healthcare of animal experiments, which formed the basis for his 2010 PhD and his 2011 book The Costs and Benefits of Animal Experiments. Andrew’s other publications have examined the contributions of the livestock sector to climate change, vegetarian companion animal diets, the animal welfare standards of veterinarians, and the latest evidence about animal cognitive and related abilities, and the resultant moral implications. Jasmijn and Andrew will be presenting on their work and leading a Q&A session with the audience. Join us for an entertaining and fun afternoon. Afternoon tea will be served and is included in the ticket price. Tickets at Sticky Tickets. 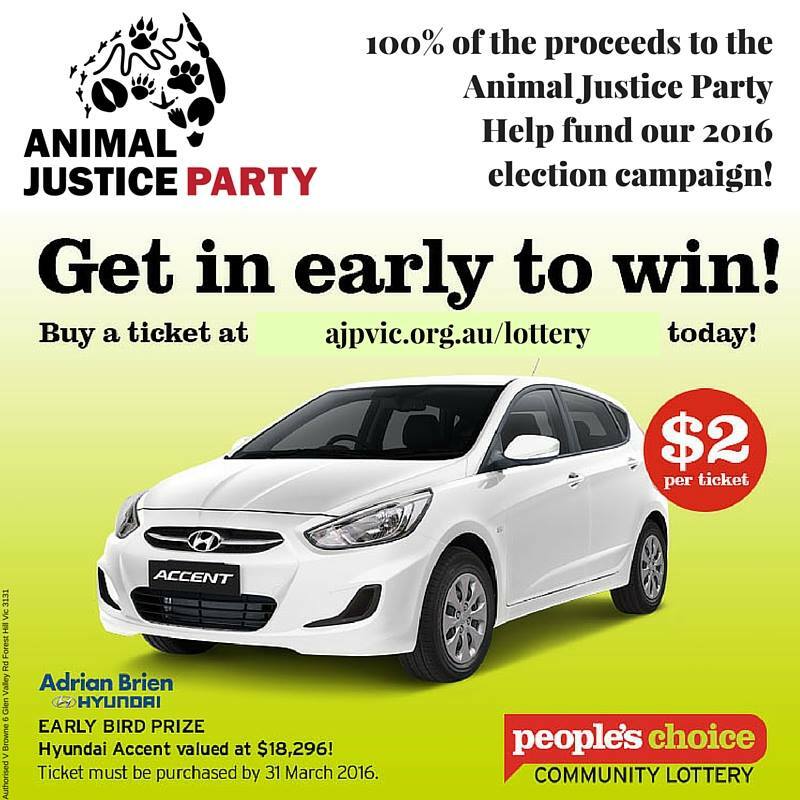 Help fund the Animal Justice Party's election campaign and go in the draw to win over 150 prizes, including 3 CARS, travel vouchers, landscaping and home appliance packages, computers and sporting equipment. TICKETS ARE ONLY $2 and 100% of your ticket price goes to the AJP. BUY TODAY to go in the draw for an earlybird prize of a Hyundai Accent. 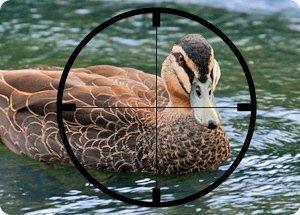 This coming weekend marks the unfortunate start of another slaughter of native water birds. Many of us will be heading to the wetlands to rescue as many birds as we can. The following weekend is the Oakbank Jumps carnival in Adelaide, which then kicks off another season of jumps racing in Victoria as well, with the inevitable deaths of horses the result. As part of our election campaign, we are seeking to obtain endorsements from people in the media, celebrities, activists, sportspeople, etc. that want to support animals and the AJP. We have run these campaigns before, and been endorsed by people like Josef Brown, Lee Coates and Juliet Gellatley. The idea is to use the network of prominent individuals to spread the word about the AJP brand, show that 'real' people are voting for us and highlight and publicly thank animal heroes. National endorsements will carry a line on 'I'm giving my vote to AJP' along with a picture and international endorsements will urge voters to support AJP by highlighting the party position. We are seeking nominees for national and international endorsements from our members. Please include anyone you can think of or have personal contact with, and send them to our Election Campaign Coordinator, Anjali Nambissan (onanjali.nambissan@live.com) during March. Once we have the list, we can begin the long process of trying to contact all these people. A short reminder that our next members' meeting will be our regular monthly meeting next Thursday 24th at 6:30pm at Ross House, 247 Flinders Lane, Melbourne. We will focus on a number of our campaigns and further election planning.